The HomeCNA3.1 Coax MDU Master Bridge DYNAMIX HP-52/M Enables You to Start the Triple-Play Services to a Small Scale Apartment Building. No Additional Network Wiring is Necessary. You may just Use the Existing Coax Wiring in the MDU Building, and be Ready to Provide Broadband Services to Subscribers. 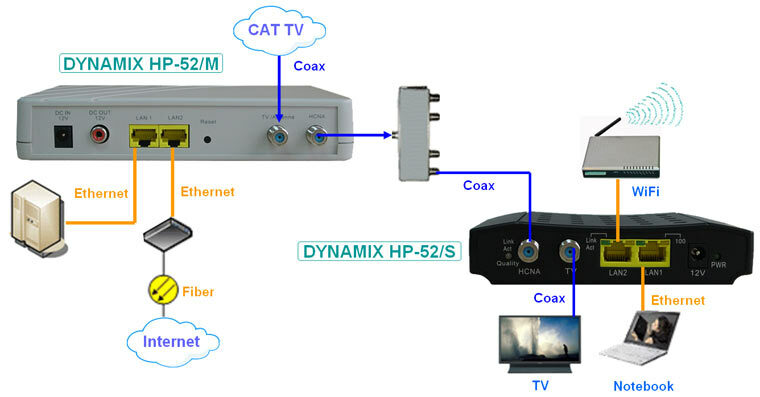 Low Initial Deployment Cost DYNAMIX HP- 52/M Compare to the High Cost xDSL Solutions, Suitable to Small Scale Building with Limited Subscribers. Via the RJ-45 Ethernet Ports, Connect the MDU Master DYNAMIX HP- 52/M with Broadband Access Devices such as Fiber Media Converter and ADSL/Cable Modem. Remote Management Function in DYNAMIX HP- 52/M Help to Ease the Support. HCNA : Two F-Type Female Coax Connectors. One for HCNA, the Other for TV or Antenna.